Hundreds of thousands of poor, middle-class, old, sick, and young Virginians will get increased access to health care as the Commonwealth, joining 33 states and the District of Columbia, saw the crumbling of five years of fierce GOP-led opposition to an expansion of Medicaid under the Affordable Care Act, aka Obamacare. Partisans, who reviled an enlarged role of the state in health care, got to pin a partisan fig leaf on the state’s move, by amending the social support program to force more recipients to work or show that they cannot, to receive Medicaid benefits. Although neither the Trump Administration nor congressional Republicans are likely to heed it, Virginia and other states are sending a clear message that voters see health care as a right, not a privilege, and that voters will go to the polls to deal with those who claim to represent them but who make a near religion out of seeming to want to punish the sick and poor and to make costlier the already skyrocketing price of medical services. Maine voters have approved an expansion, bitterly fought still by that state’s governor. 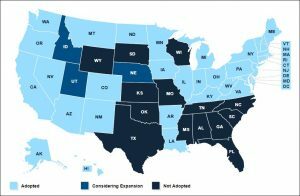 (The state’s uncertain status with the program explains why some analysts say Medicaid has expanded in 32 not 33 states.) Utah has edged into an expansion and voters there will decide whether to increase it more. Idaho and Nebraska both are working or on the brink of fall ballot measures to determine if those states will expand Medicaid. The states that still resist the expansion are mostly in the Deep South and Midwest. Virginia is one of the larger holdout states to finally sign on. Independent research shows that states that have expanded the program have not experienced fiscal regrets and that claims that they would see dire financial consequences are just wrong. Medicaid expansion has led to improved health coverage by more Americans, with largely positive effects on access, affordability, and use of health care, especially among poorer participants, according to multiple independent, nonpartisan, evidence-based studies. It may be too early to tell but this also has tended to show improvements in recipients’ health outcomes. Virginia’s Medicaid program isn’t particularly generous but as many as 400,000 participants have said they will welcome the help they’ll get through it. Opponents to the expansion, though entrenched in their beliefs that the ACA was wrong and its generous aid for Medicaid expansion would founder, leaving states with onerous bills for the program, found themselves on the wrong side of voters’ ire — many were swept out of the state house in a “blue wave,” fueled by opposition to Trump and with concerns about health care and its affordability and access. Massachusetts already had a state law calling for a key component of the ACA, the “individual mandate” that requires citizens to show they have health coverage when they pay their taxes. New Jersey has just passed a state individual mandate. Meantime, states and a sizable number of health advocacy groups are starting what promises to be fierce opposition to ACA alternative health plans, advocated by the Trump Administration and congressional Republicans — coverages offered short term or by defined groups or associations. These have existed before, are heavily regulated by many states now, and have been trashed by opponents and experts. They say these policies can be cheaper, especially for healthier young Americans. But they provide such skimpy or restricted benefits that they’re akin to paying small premiums for zero coverage when needed. In my practice, I see not only the harms that patients suffer while seeking medical services but also their struggles to access and afford safe, efficient, and excellent medical care, and especially to ensure they have some kind of insurance or government support to help pay for it. As partisans carve away at public payment for Americans’ medical care, and as employers, insurers, doctors, hospitals, Big Pharma, and other providers send medical costs head skyward, the idea of sharing the burdens of medical bills is not just sounding like a progressive pipe dream but a necessity to more Americans. We have a long way to go on health costs and coverage, but it’s good to see Virginia officials step up to try to care better for state residents. Those midterm elections, upcoming this fall, look more important than ever.